This is the 600th post published at Bucksome Boomer! To celebrate, there will be a giveaway later this week so I hope you be sure to come back for that. But there was bigger news in the world this past week. The first momentous news this week was that Moammar Gaddafi was killed in Libya. His role in the Lockerbie plane bombing was never forgotten and I hope the victims’ families now have closure. After nine years it was good to hear the announcement that American troops will be out of Iraq by the end of the year. Just think how that $1 trillion could have been spent in-country. I shared several ways to save on movie tickets at Couple Money. Be sure to read the comments for more great tips on how to go to the theater cheaply! There is a lot of great writing at other sites that I want to share with you and for that reason, I’ve added this section to the weekend scoop. Today’s picks come from my Yakezie Fall Group bloggers. The difference between being frugal or cheap with pet care is shared by Baking the Budget. Debt Free by Thirty confesses that she spends a lot of money for Christmas, but there’s a personal finance twist. It is possible to afford eating out with these tips from Dining Out Challenge. First Gen American asks if she’s a feminist. Be sure to read the discussion. Sometimes it’s better to spend money than time as Live Real Now experienced. Money Crush asks if you justify purchases and shares why it might not be a bad thing. Get the basics on life insurance from Money is the Root. So Over Debt questions how people live on minimum wage pay. That’s a great question for most parts of the country. Read 1099 words on paying cash for a car at The Family CEO. The Happy Homeowner shares money rules to live by. What are yours? As always, I gotta tell you about the latest giveaway at Two Savvy Sisters. We’re getting away coupons good for a pack of De Wafebakker’s waffles. There will be 14 winners so your chances are good to get free breakfast! Faith and Finance is giving away a $40 Amazon gift card. Enter before October 31st! Surviving and Thriving has a great gift pack of swag from Save-Up. This one ends tomorrow at 9 pm Pacific. Brave New Life is giving away three Kindle copies of Early Retirement Extreme (you can read my review here). Enter by midnight on the 24th. Mom’s Plans has a $50 NOVICA gift certificate up for grabs. Entries close at midnight Friday. Frugal Toad’s first giveaway is for a $50 Amazon gift card. Great way to start but get your entries in by the 30th! Wow, that’s a lot! May you have 600 more! Thanks, Sam. I must say it has happened amazingly fast! Thanks for the link, BB! Thanks for the mention! And congrats on 600 posts. Wow..a momentous week for not only you but also for America. Thanks for the link. Congratulations on your 600th post! That’s quite a milestone. Julie, First Gen American, Shanendoah and ProfitsOn: Thanks for the congratulations. If you told me when I started that I would have 600 posts in 2 1/3 years, I would have probably quit then and there. It’s better to celebrate as they come! congrats on your 600th post and heres to many more!! 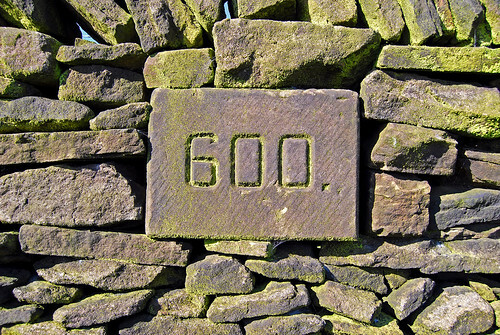 Congratulations on your 600th blog post and wishing you many more. Previous post: Grandpa Got Scammed for $2,500 … Almost! Next post: What’s the Life Expectancy of That Appliance?